The time for snuggling up with steaming cups of hot chocolate and warm plaid blankets is getting closer. There’s a romantic mood in the air when it comes to wintertime, and the decor ideas for a winter wedding are plentiful. Be inspired by the festivities and colors of the season by incorporating them into your table settings. 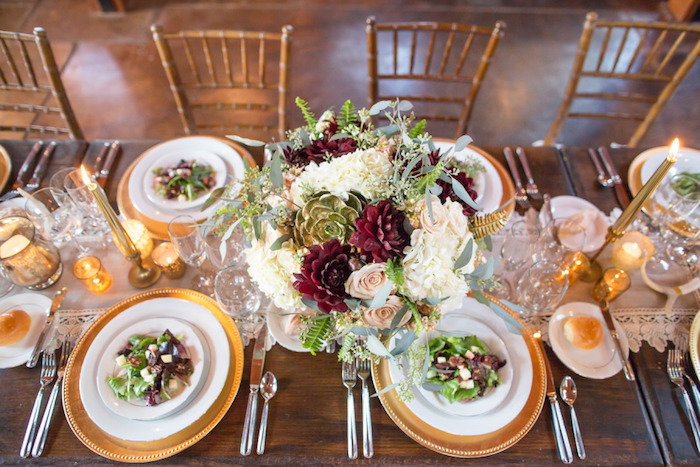 Winter tablescapes can be really stunning, and give your guests that celebratory feeling. Dark reds are a quintessential color for the holidays. Pair red blooms with some greenery, candles and frosted silver accents. 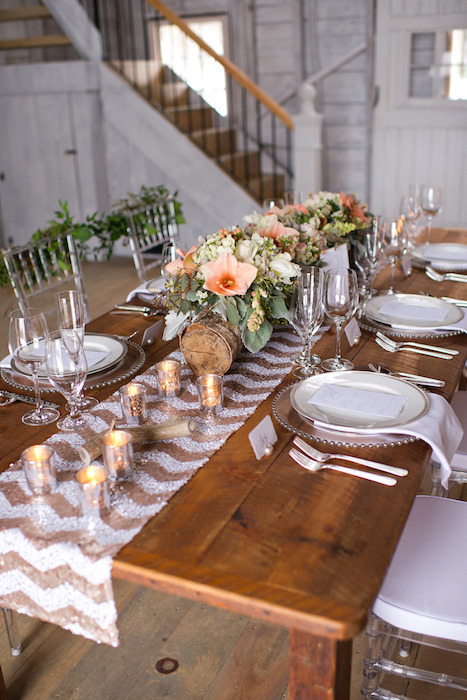 If you’re having a rustic themed wedding in a barn or cabin, play up to your surroundings in your table settings. 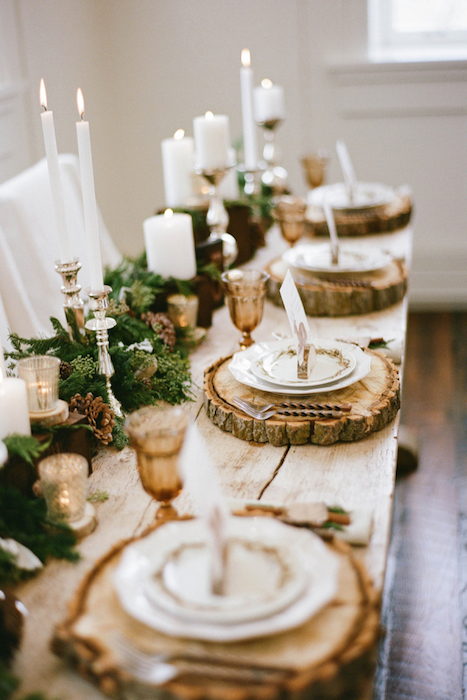 Tree rounds with leafy garlands contrast with polished candlestick holders. 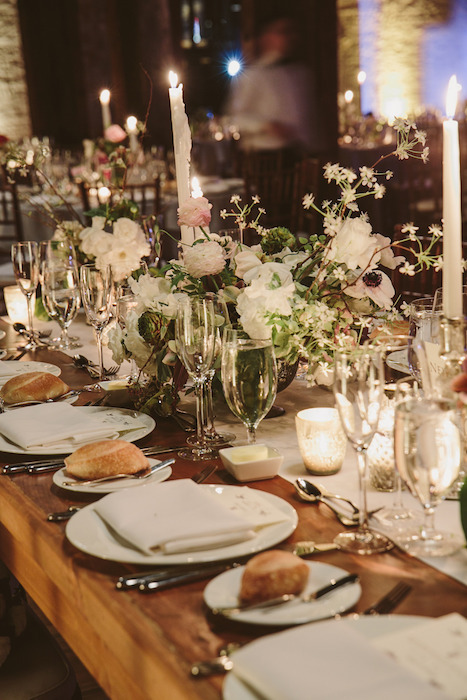 Bare wooden tables are a great canvas for an elaborate tablescape without making the elements seem overwhelming. 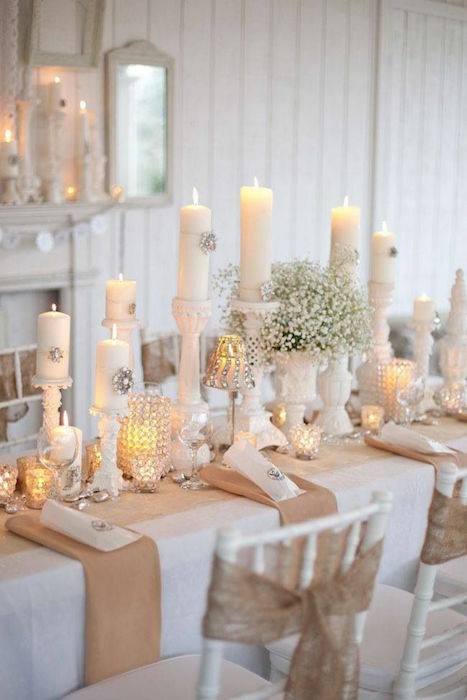 An all-white table is softened by touches of burlap and crystal decorations. 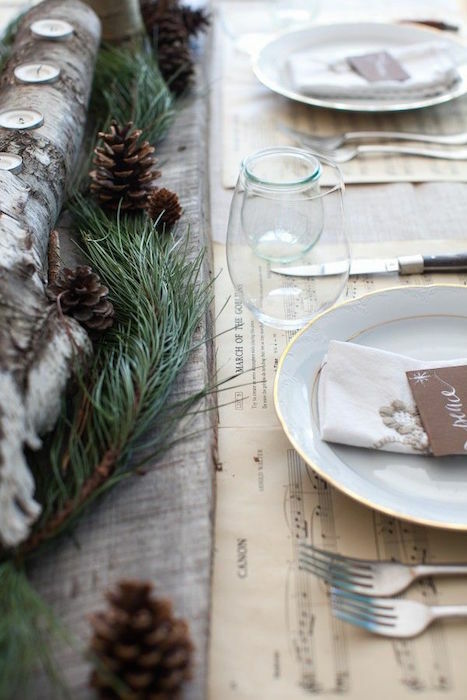 Give traditional ideas an unexpected twist, such as using sheets of Christmas carol music as placemats. Also, using heavy tree branches as a table runner with cut outs to insert candles. 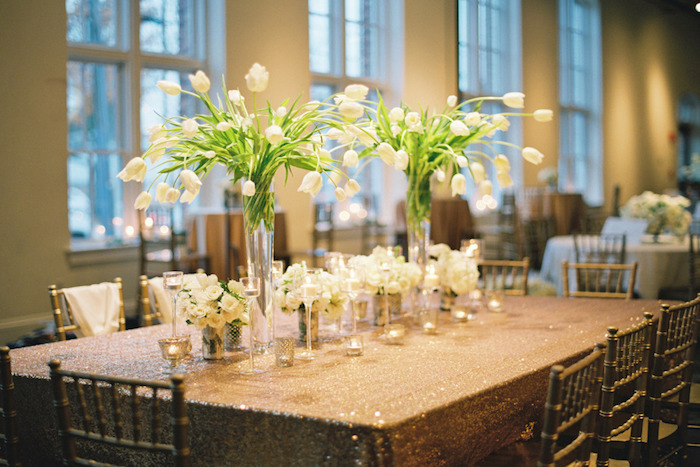 Get the celebrations started with a sequin and chevron table runner; we all know that sequins are a cue for partying. Use classic color combinations on your table with white, green and red and include clear blue glasses. 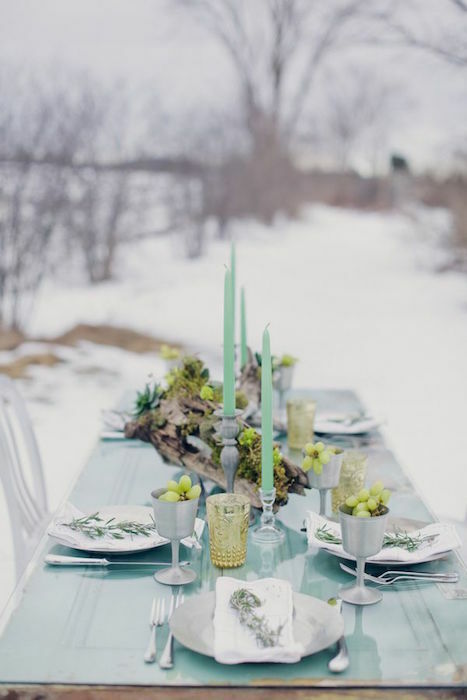 We love the unexpected aqua candles on this winter table, with the complementary matte silver tableware. 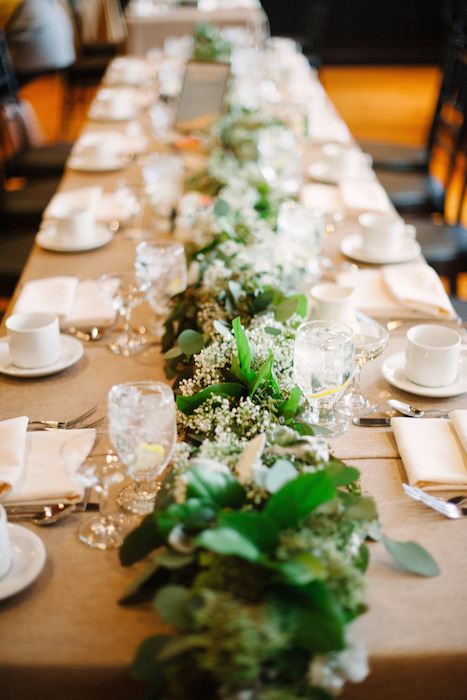 Runners can really transform your table, especially when they are full of seasonal greenery and baby’s breath. 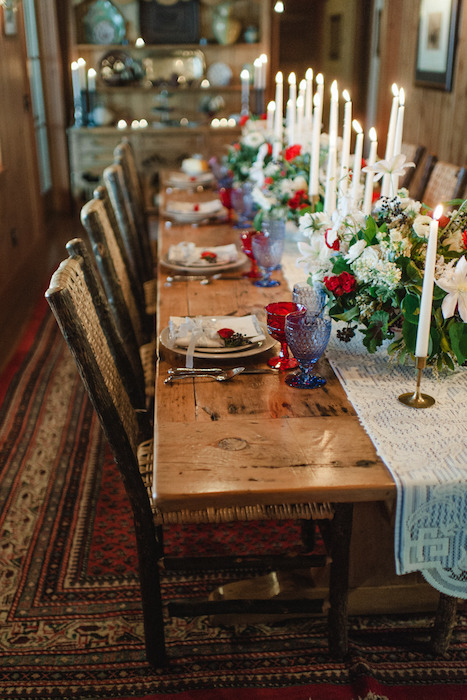 A simple winter tablescape can be easily created by starting with a stunning tablecloth. These gold charger plates work well with the bare table and lace runner. 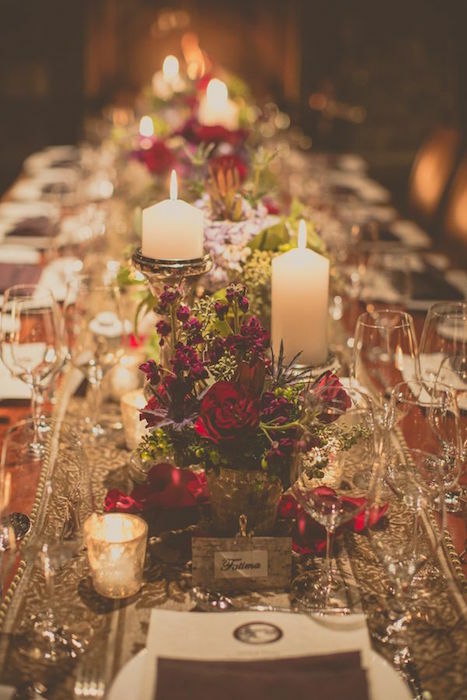 The look is completed with these amazing gold candles and an abundant floral centrepiece.